After getting good response for the mobile version of Orkut, orkut team has now released a orkut mobile application. You will get a great Orkut experience with this application on your mobile phones. Orkut Mobile App can be installed on all the java enabled mobile phones. Upload photos to orkut on-the-go, directly from your phone. View scraps, friends’ updates, and photo albums while you’re offline. 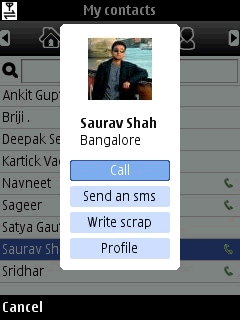 Easily call or SMS your orkut friends and address book contacts from within the app. Get automatic updates when your friends change their contact information or orkut profiles. Good to see news on Orkut, Although i have an account don’t use it too much! There are lots of bugs in this application. I don’t understand why google has released this application. It takes hell lot of time to start the application,uploading a photo is an impossible task. You shud have browser (ex. Opera) in your mobile and then u can browse orkut as well as other sites too. U will enjoy accessing orkut on your mobile only when the connection speed of your mobile service provider is good. I m using sonyericsson w810i . which is the best browser to this phone . i came to know that through netfront 3.1 we can acess orkut in mobile . in orkut while creating profile one can submit mobile number of other person.which can make in trouble to others.i can submit my mobile details of others than users can see in my profile other persons mobile no and they will start calling him. Orkut is a popular global social community system much like facebook and myspace. I have used Orkut in the past, but personally I find though, that it’s a bit shady. Anyone can see your profile and its not as selective and private as facebook. With that said, its probably the easiest way to find your global friends. in most of sites after registration if ur details showing in public than while registration what ever mobile number will be submited that mobile number get security code/registration code on mobile after that enter registration code than only profile will get activated. Pretty much every new phone can run Java applets. You’d want to start to learn the Java language. A great application for coding and debugging Java applications is JCreator, which can be downloaded for free. .-= Professional website design´s last blog ..Outstanding Web designing solutions =-. You’d likely want to use Java 2 ME (Micro Edition) platform. It is used widely on MANY hand held electronics, including cell phones. I tried orkut using my ipod touch and it works great! I don’t know, who still using Orkut? Isn’t everyone already moved to facebook? For those of you starting a new business, check out my online logo designs site. Cell phones are awesome especially nowadays that my cell phone can be my office. With the internet and web options, I am fully connected to the rest of the world. Hurray for cell phone inventions I can now work from within my car.